Indus Valley Civilization sometimes referred as the Harappan Civilization flourished in the Indus River basin in modern-day Pakistan and northwestern India between 2500 to 1700 BC. Today’s knowledge about the Civilization almost exclusively bases on archeological finds. Unfortunately, a lot remains unknown including both origin and collapse of the Indus Valley Civilization. It is uncertain whether Indus Valley Civilization consisted of several independent city-states or it was a centralized state. Indus Valley Civilization writing system consisting of 250 to 500 characters has not been completely deciphered yet. The existence of Indus Valley Civilization as one of the earliest world’s civilizations was confirmed in the 20th century although the ruins of Harappa were already described in the 19th century. However, the existence of ancient civilization was identified after systematic archaeological excavations under Daya Ram Sahni, Rakhal Das Benerjee, Sir John Marshal and Sir Mortimer Wheeler in the first half of the 20th century. Since the oldest and most important finds such as both large cities - Harappa and Mohenjo-daro were discovered near the Indus River the civilization was named after the Indus River although later archaeological excavations revealed that it actually spread far beyond the Indus Valley. 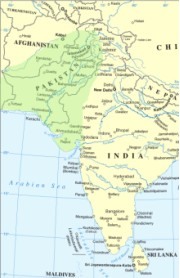 The northern and northwestern Indian subcontinent went through a major change in the middle of the 2nd millennium BC. Indus Valley Civilization finally collapsed and the region was settled by the Indo-Arians. The collection sacred texts known as the Veda consisting of four collections: Rigveda, Yajurveda, Samaveda and Atharvaveda is the main source for history of the northern Indian subcontinent between 1500 and 550 BC. For that reason the period between 1500 and 550 BC is commonly referred as the Vedic period during which were established various kingdoms. The caste system which is still distinctive for Indian subcontinent has also its origin in the Vedic Period.